Jemison Faust received an MFA from the School of the Museum of Fine Arts in Boston. Her awards include a Fellowship in Painting from the RI State Council on the Arts and a Fellowship from the MacDowell Artists Colony. 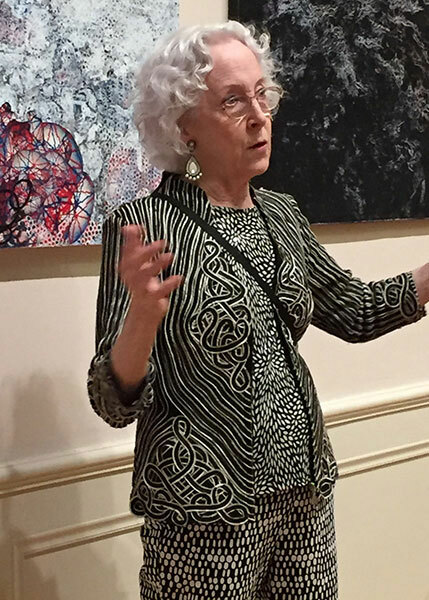 She twice received 1st place in Painting and twice received 1st Place in Mixed Media at the Newport Art Museum’s Annual Juried Exhibitions where, in 2017, she was winner of “Best in Show”. Her work is represented by Atelier Newport in Newport RI and the Bromfield Gallery in Boston. Her many layered collage paintings and objects are loosely based on amusing and poignant conversations she has had in her work as a Personal Organizer as well as the larger issues raised by the journey through someone’s life. The most recent objects – “Are you saying yes to the dress?” – come from musings about the current offerings on TV after a long day spent in the studio. Click here for Jemi’s resume.